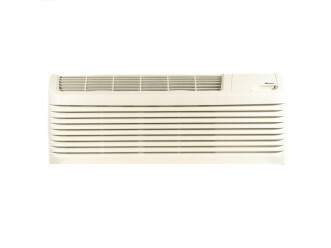 The Amana PTAC PTH074G35AXXX DigiSmart Heat Pump 7000BTU, 265V, 3.5KW, 20AMP R410A is a designed and manufactured, packaged terminal air conditioner with a DigiSmart heat pump has the following specs: 7000BTU 265V 3.5KW 20AMP R410A. With Amanas most advanced technology yet, this is the quietest PTAC unit Amana has to offer. Requiring no floor clearance this unit is extremely versatile and features a 7 5/8” unit front depth, maximizing usable space for your guests. So if needed, this unit can be installed flush to any finished floor or higher up. *Note* some accessories do not have a zero clearance. Among these great features, this PTAC unit includes an automatic emergency heat. If the heat pump compressor system fails, your PTAC will automatically switch over to electric resistance heat, keeping your guests warm until the issue can be resolved. *NOTE: for first time installations, a wall sleeve and exterior grille will be required. 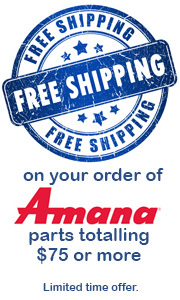 Please go to the Amana PTAC Parts and Accessory section for pricing. 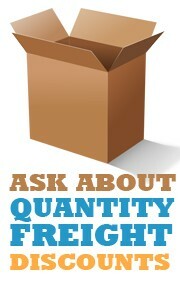 Click Here to view SQFT and BTU chart. Click Here to view power cord and receptacle configurations. Energy Efficiencies: With EERs up to 11.7 and COPs up to 3.4, the Amana unit’s high efficiencies may qualify you for many of the rebates offered by electrical power companies. Quiet Operation: The Amana PTAC has been redesigned to be the quietest PTAC Amana has ever built. The unit’s state-of-the-art design and construction provide a quiet environment, allowing guests to enjoy peaceful, sleep-filled nights. Assembled in the USA for 30 years: assembled at the Amana plant in Fayetteville, TN, using Goodman resources including engineering, production, and testing. Increased Dehumidification Capacity: Maintain lower humidity levels in rooms while cooling them without the need for expensive add-ons. As a result, guests feel more comfortable at higher temperatures, thus reducing cooling costs. Seven-Button Touch Pad: Provides complete control to guests for in-room comfort while maintaining energy efficiency. Five-Year Limited Warranty: Enjoy one of the most comprehensive warranties in the industry: First Year: parts & labor; Second through fifth years: parts & labor on certain sealed system components; second through fifth years: on certain functional parts only. 100% Run Tested: All units are 100% run tested at the Amana plant in Fayetteville, TN, including leak checks during manufacturing and again prior to shipment at the warehouse. 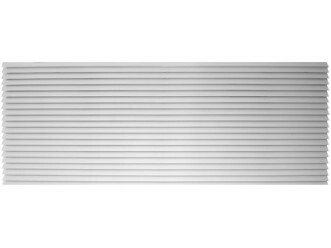 7⅝” Unit Front Depth: Enhance valuable room space with our slim unit front, which has a sleek 7⅝” depth, one of the shallowest silhouettes in the industry today. 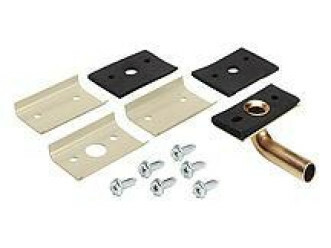 In addition, to inhibit guest-tampering, the front can be secured to the chassis with a hidden screw. 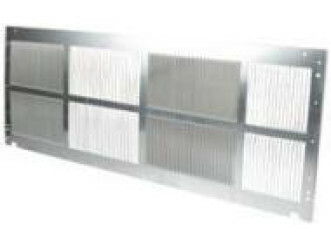 Removable Condenser Shroud: Allows easy access to enable regular cleaning of coils, which is essential to maintain unit efficiency and protect the compressor for long unit life. 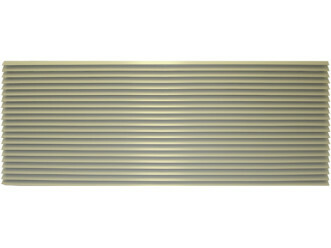 Easy Pull-Out Filters: Our filters are washable and easy to maintain. Filter Dryer for Sealed System Refrigerant: Standard in all units to protect the compressor and lengthen the life of the unit by removing moisture and preventing acid formation. Condensate Dispersion System: Amana PTAC's condensate dispersion system removes condensate from indoor cooling operation by throwing water directly on to the outdoor coil for rapid evaporation and increased cooling efficiencies. 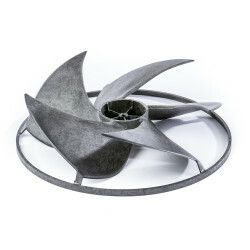 The slinger ring on the new, enhanced fan draws water up and into the fan blades. This water is then atomized and evaporated into the atmosphere through the condenser. Increased surface area from the coil allows more water to be evaporated on the sides of the coils and helps to minimize condensate run-off. Front Desk Control: Each unit comes equipped with the DigiSmart™ control and energy management software. With Digi-Smart™ using the optional RF Antennae, all units can be wirelessly connected to a central hub for enhanced energy savings and diagnostics. Amana brand PTACs also have a low-voltage interface capability with a field-supplied front-desk ON/OFF switch. Room Freeze Protection: When the unit senses temperatures of 40°F or below, the unit activates the fan motor and either the electric resistance heater or the hydronic heater. Easy-to-use Controls: No complex controls to confuse your guests and create phone calls for your manager. Controls are easy to read, understand, and activate. The Amana PTAC new 7-button control panel provides guests with complete control of the unit for their in-room comfort while maintaining overall energy efficiency. Easy to Service with On-Board LED Diagnostics: The main components are easily serviced and there is no guessing to determine the problem with our easy-to-read diagnostics. Stonewood Room Front: The Amana PTAC Stonewood room front strikes the balance between attractive styling and practical design. Distinctive contours and a modern appearance enhance the character of even the most luxurious room, while the sleek 7⅝” depth maximizes usable space for your guests. Remote Thermostat Control: When the DigiSmart™ wireless remote thermostat (DS01E, sold separately) is set up, both the remote thermostat and unit control panel continue to control the unit, providing flexibility and home-like system control. Installation requires no more than pressing two buttons. 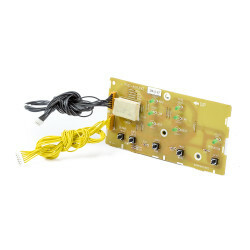 No need to run wires or make electrical connections. Remote Temperature Sensing: Guests enjoy ultimate comfort with consistent climate control. When the field-installed thermistor (RTS03) is used, the unit-mounted thermostat is overridden to allow more accurate, internal wall-sensing of room ambient temperature. Extended Heat Pump Heating: Heat pump models will operate in the heating mode down to as low as 24°F outdoor ambient temperature. Zero Floor Clearance: The unit can be installed flush to a finished floor, if desired. (Some accessories do not have zero clearance). 30-Second Fan-Off Delay: The fan continues to run 30 seconds after the compressor has stopped in either cooling or heat pump mode and after electric heat has been turned off. 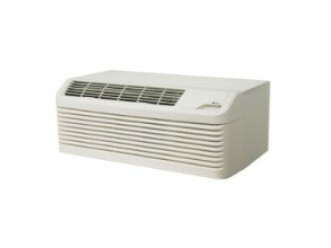 This improves efficiency by dispersing the conditioned air on the coils into the room. Compressor Lock-In: This feature helps prolong the life of the compressor by preventing short-cycling. When the compressor is switched from Off to On because room temperature has risen or fallen below the specified limit, it will remain on for at least 4 minutes. If the temperature set-point is changed during this 4 minutes, the lock-in feature is overridden. 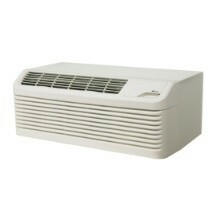 Automatic Emergency Heat: No more “my unit is not heating” complaints during the middle of the night. Heat pump units will automatically switch over to electric resistance heat if the heat pump compressor system fails or if the heating load is greater than the unit capacity. Constant Fan Mode: Take advantage of each unit’s dual options — select continuous fan operation or cycle the fan ON and OFF with the thermostat. The Amana PTAC's new 7-button design allows guests to select fan performance while allowing the owner to have the unit revert to the desired program of continuous fan or cycle with conditioning. Hidden Ventilation Control: The ventilation control lever is hidden from the occupant's view to allow you to manage ventilation requirements. 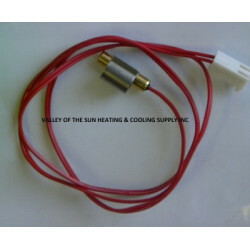 High-Pressure Switch: Protects the unit from high pressure and damage to the unit, helping to ensure long unit life. Amana® brand PTAC heating or air conditioning units identified as PTH, PTC and DRY “E Series” units are warranted by Goodman Company, L.P., to consumers against defects in materials and workmanship under normal use and maintenance. See details below. 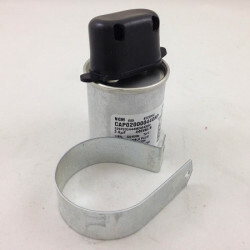 First-Year Coverage (Entire Unit): Goodman Company, L.P will repair or replace, free of charge (including labor, parts freight and new refrigerant if required), any part of a unit or Amana brand accessory that proves to be defective due to workmanship or materials within the first year after the date of purchase. Second through Fifth-Year Functional Parts Coverage: During the second through fifth years, Goodman Company, L.P will provide, free of charge (including parts freight), the listed functional parts that prove to be defective due to workmanship or materials. 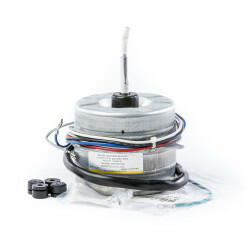 Components covered are factory installed and include: unit fan motors, unit blower wheels or fans, unit thermistors, circuit board, transformers and relays, unit heaters, reversing valve solenoid, unit power cord and unit capacitors. Second through Fifth Years Sealed System Coverage: During the second through fifth years after the date of purchase, Goodman Company, L.P will repair (including labor and replacement refrigerant) any refrigerant leaks caused by defects in workmanship or material of a unit, and will repair or replace (including labor, parts freight and replacement refrigerant) any portion of the evaporator coil, condenser coil, compressor, reversing valves or connecting tubing that prove to be defective in workmanship or materials. 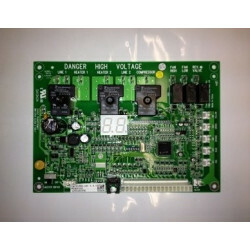 For complete warranty details, please see the warranty card included with your unit or click this warranty link.